Use any of our Flakes to make your metal flake guitar paint. 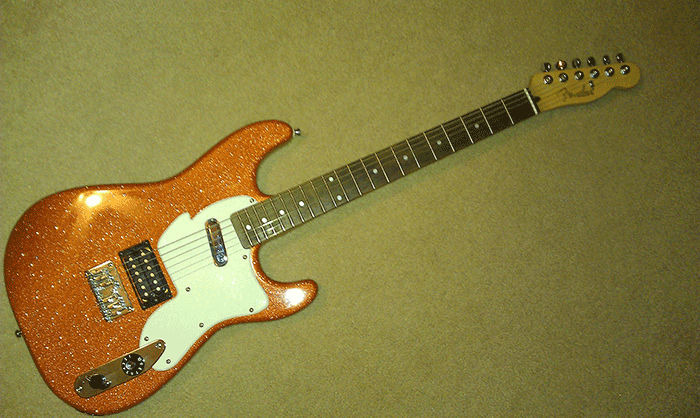 A very nice use of our Orange Copper flake – and without even a compressor! I thought you guys might like to see a few pics of the guitar I shot with your Copper Orange metal flake. I shot this thru a Preval aerosol sprayer in my garage. It was nearly as easy as popping the lid off an ordinary rattle can. I expected the job to turn out looking good, but it turned out so much better than I could have imagined. Everyone I’ve showed it to thought it was a professional paint job. My wife, who is typically indifferent about my guitars, loved it. I can’t wait to shoot more flake on another guitar. You’ll definitely be seeing another order from me soon. Thanks! !